This 3¼ mile circular walk from Peckham Rye Station includes regeneration projects and other features of interest. It can be extended by visiting Peckham Rye Park and can also be combined with the Peckham (north) route as indicated in the text. The station opened in 1865 and in 1921 the waiting room became a billiard room. The last Sainsbury's shop with counter service was at 61-3 Rye Lane (now Clarks shoes) and closed in 1982. The neighbouring Baptist Chapel opened in 1863. The Royal Mail Delivery Office includes the former Quaker Meeting House of 1826. Beyond the railway the Peckham Experiment has mosaics by Tom Phillips. The Petitou Cafe has a map terrace by Lorraine Rutt. The award winning renewal area includes artwork by Anthony Gormley, Tom Phillips, Heather Burrell and others. Flat Time HO has a book relief by John Latham and Topiary outside the school was created by Lucy Swan. These streets are part of the Grove Vale estate. The houses have attractive railings and gates. On the right is the Centre for Wildlife Gardening run by the London Wildlife Trust. It was established in 1989 to provide new trees following the hurricane of October 1987 but now offers ideas for attracting wildlife to gardens. Continue to the end of the road. Go right at Ondine Road and left at Grove Vale to the roundabout. Walk alongside Goose Green to the left. This was the village green of East Dulwich (look for goose-themed artwork). Across the green are public baths (undergoing redevelopment). St John the Evangalist Church was designed by Charles Bailey in 1863-5 but rebuilt post war. Behind the children's playground at the far end is a mural 'William Blake's Vision of Angels'. The parade of shops/cafes has street furniture designed by Zandra Rhodes. On the corner was an air raid shelter for 672 and in WWII hay crops were grown. The area to the left had a lido opened in 1923 and closed in 1987. The common was used for sports & fairs and had a bandstand (destroyed in WWII). In both wars huts held POW's (one remains as a playgroup centre). Further along on the right was the site of a Bus Garage operated by the National Steam Car Company 1911-9. The clock tower has been recreated in the development (plaque). On the left in Consort Road is the former Relief Station of 1901 (now a health centre). The Metropolitan Beer & Wine Trade Society built seven almshouses for 13 residents in 1852. A new wing of eight houses was added in 1872. These front Gordon Road where there is also the Passmore Edwards Nunhead Library of 1896. A notice explains the story behind the name. Across the road are Beeston's Almshouses, built for the Girdlers Company in 1834. They replaced buildings which were sold for the construction of London Bridge in 1824. The seven houses (extended in the 1960s) were for freemen of the company who also received a pension. The former church school of St Mary Magdalen (1856) has been converted to accommodation. The former site of the RACS on the left has been redeveloped. Cross Peckham Rye into Sternhall Lane. Follow this round into McDermott Road. Just past Choumert Grove on the right is McDermott Grove Wildlife Garden, renovated by the BBC and local residents. Return to and go left at Choumert Grove. On the corner a pre-fab remains (due for demolition). Further along is the Peckham Islamic Centre (mosque). On the right just past Choumert Road is Choumert Square built 1876-82. 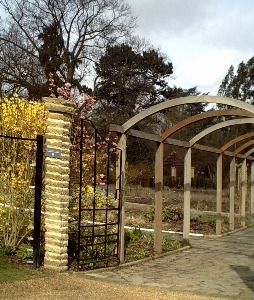 This gated garden is noted for its floral displays. Return and go left along Choumert Road. Palyn's Almshouses were built by the Girdlers Company in 1852. Their original premises had been founded in 1612-3 in Old Street but were destroyed in the Great Fire. There are remains of the Tower Cinema opened in 1914. The basement was used as a shelter dring WW1. It closed in 1956 and now provides an entrance to the car park. Only the corner building remains of the former Jones & Higgins store. This began in 1867 and took over more premises until replaced in 1985 by the Aylesham Centre.